An entry in John King’s daybook for Sunday 18 November 1860 records Eugene von Guérard’s arrival at his Gippsland property, Snake Ridge. To reach King’s property, situated on the La Trobe River between Traralgon and Rosedale and extending in a northeasterly direction towards Angus McMillan’s property, Bushy Park, near Stratford, von Guérard had skirted around the upper perimeter of the barrier presented by the Koo Wee Rup Swamp, probably, his sketches suggest, on horseback. 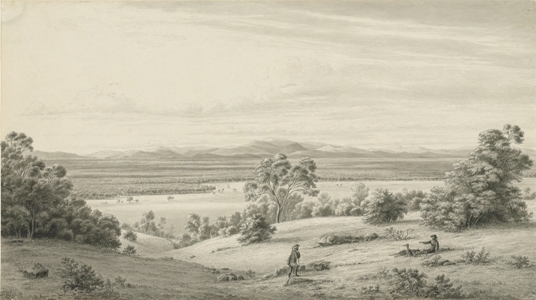 He spent the next two days, 19 and 20 November, capturing the breathtaking views from Snake Ridge: the view to the northwest, towards Mt Baw Baw, was set down across two pages in his small sketchbook and, on larger sheets of paper, the prospects to the north and then to the northeast, towards Ben Cruachan and the Gippsland Alps (fig.1). This last, meticulously detailed and extensively annotated drawing, on which he worked over both days, provided him with all the information required to realise this painting, Mr John King’s Station, in his Melbourne studio in 1861. Mr John King’s Station was painted at the peak of von Guérard’s career, at a time when the leading art critic of the day, James Smith, championed him as ‘decidedly the landscape painter of Australia’. Today he is again regarded as one of, if not the, greatest landscape painters to have worked in Australia in the nineteenth century. This work exemplifies the qualities on which that reputation is founded, notably his singular ability to portray the minutiae of the natural world within the context of a vision of great breadth and grandeur. It is a highly resolved and sophisticated composition that nevertheless speaks of the specificity and depth of von Guérard’s response to this beautiful Gippsland landscape, including its luxuriant grasslands and the fall of light and shadow over the distant mountains. It is also one of von Guérard’s most enigmatic pictures. John King, for whom Mr John King’s Station was painted, was born in Parramatta in 1820, the grandson of Philip Gidley King, Governor of New South Wales from 1800 – 1806. In 1842 he travelled overland from the Monaro Plains to Gippsland, following the route discovered by Angas McMillan (assisted by an Aboriginal guide, Jimmy Gibber) in the previous year, to become one of the first Europeans to settle on Gunaikurnai country. He managed the Snake Ridge run, then leased by John Reeve, until 1851, when, under the aegis of John King and Co., he purchased it. By 1860 he was well established on a run that, as von Guérard recorded, covered ‘100 square miles’ – one of the largest in Gippsland. Not only could his achievements, and his status, be appropriately celebrated in such a painting but, in the context of the Land Sales Act of 1860, it was an expression of an established claim to the land. Mr John King’s Station is a property portrait, a genre in which von Guérard had established himself in the 1850s with his highly successful Western District homestead pictures. And yet the homestead itself, which was described by a contemporary as ‘a beautiful old place on the point of a hill overlooking the Glengarry (now Latrobe) River, well-timbered with a lovely view of the surrounding country’, does not appear.1 From an elevated position we look out from the homestead garden, across the grassy foreground to what was then known as the great plain of the La Trobe, dotted with grazing cattle – the Snake Ridge run, which, by implication, extended as far the eye can see. To convey the panoramic breadth of the landscape von Guérard chose a canvas twice the width of its height; the effect is amplified by the horizontal directionality of the mid-ground tiers of trees, the successive bands of light and shadow, and the configuration of the clouds. At the same time the eye is drawn deeply into the distance, to the violet-blues of the mountain range, the southern end of what is now the Australian Alpine National Park. Except for the figures, which were not observed on the day, von Guérard remained largely faithful to his on-site drawing when he painted Mr John King’s Station in his studio: the forms of the mountains and the fall of light and shadow over them, the location of individual trees, and their specific configuration remain as they were recorded in his drawing. In his notes, and in keeping with his concern for geographical accuracy he identified the peaks of Ben Cruachan and Mt Buller and recorded that snow was still present on certain peaks in mid-November; he also observed the native Boobialla, described the ‘soft, dark English roses’, the ‘flesh-coloured blooms’ of the honeysuckle, the ‘yellow’ of the ‘meadows’ with their ‘herds of cattle’, the reddish green of the trees at the foot of the mountains and the ‘very fine violet blue tones of the mountains’. His reference to the ‘grass in the foreground’ was translated into what must amount to thousands of brush strokes that describe its luxuriance, blade by blade. On the day, as was typical, he chose his vantage point with care, with consideration for the compositional geometry of his painting: the mountain range rises to its highest peak in the centre of the composition, and it is aligned with the expressive, and centrally placed, eucalypt; the hedge of roses on the left and the vegetation on the right, identified on the drawing as a rose and ‘Bubilla’ (Boobialla), frame the view. In the shift to the more panoramic dimensions of the canvas he extended his field of vision beyond that of the drawing, to encompass more of the view to the west (the left of the composition). The figures that von Guérard introduced to his painting have generated, and will continue to generate, much speculation as to their meaning. Two groups of figures appear in the painting, each apparently oblivious to the presence of the other. The two Europeans, presumably John King, standing, and his gardener, attending to the roses being cultivated along the picket fence, are bathed in full light. King’s position as the owner of the property is belied by the scale of the Europeans and their placement in the middle ground, King with his back to the viewer. By contrast the Gunaikurnai man, woman and child take centre stage in the immediate foreground. Their presence, albeit in shadow, is commanding. The portrayal of the Europeans as actively engaged in the cultivation of the land (gardening) may, as Paul Fox suggests, reflect contemporary nineteenth century views of progress, which included the belief that the cultivation of the land, here emphasised by the watering can and rake in the foreground, justified the acquisition of it. The now debunked belief that Aboriginal people did not manage or cultivate country is, ironically, contradicted by the evidence of the painting. The ‘necks’ of grassland screened by promontories of bushland that are visible in the middle ground were the result of a system of controlled burning practiced by the local Brayakaulung clan, to encourage fresh growth and attract game. Von Guérard’s portrayal of the Gunaikurnai family suggests his cognizance of, and sensitivity to, the actual realities faced by their people in mid-nineteenth century Gippsland. As Nicholas Thomas observed of the Aboriginal people portrayed in von Guérard’s View of the Gippsland Alps from Bushy Park on the River Avon, 1861, they are depicted as both on their land, yet dispossessed of it – and subject to the paternalism of the very men who had been involved in the massacres of their people. Their anomalous situation is expressed in their contradictory apparel: the standing man holding two boomerangs, a club and a spear wears a possum skin cloak and a white feathered headdress; the seated woman and child are each draped in government-issue blankets, identifiable by the blue line on the woman’s blanket. Von Guérard did not see this Gunaikurnai family at Snake Ridge, but he did see and sketch other Gunaikurnai on his Gippsland expedition. 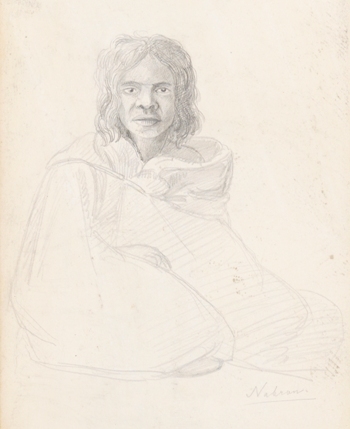 The seated woman was possibly adapted from a sketch, in his Gippsland sketchbook, of ‘Nabran’, an Aboriginal woman (fig. 2). 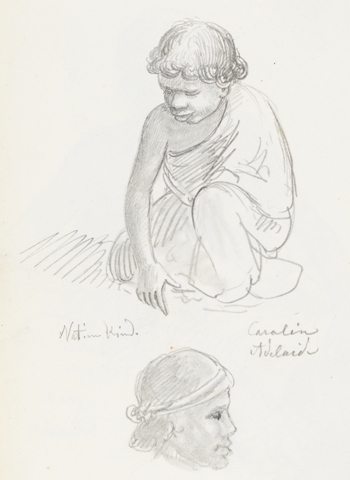 The figure of the kneeling child was imported from a drawing made in 1855 near Adelaide, of a ‘native child’ named ‘Carolin’ (fig.3). In front of her sits an empty satchel and she reaches out to pick up a dead parrot – perhaps presented by the dog, one of the thousands of European descent that quickly became attached to Aboriginal groups. The parrot, its wings splayed open to reveal its brilliant colours, is a detail not readily discernible to the naked eye but revealed under magnification – an example of the extraordinary detail von Guérard brought to his paintings. 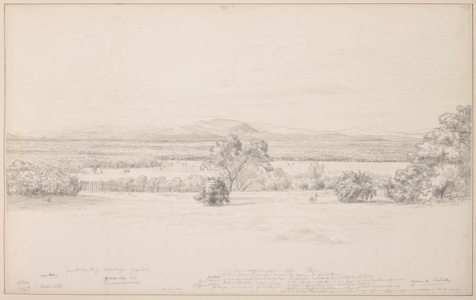 In 1862 von Guérard selected the landscape he had portrayed in Mr John King’s Station as the subject of one of sixteen highly finished pen and ink presentation drawings executed for the Governor of Victoria, Sir Henry Barkly. Titled Road to the Crooked River Diggings, Gippsland (fig.4), it depicts two travelers (and their dog) who have stopped in their tracks to take in the magnificent view. Mr John King’s Station sits alongside the National Gallery of Australia’s View of the Gippsland Alps from Bushy Park on the River Avon, 1861 as one of only two Gippsland property portraits painted by von Guérard. It is one of the most important works in von Guérard’s oeuvre to remain in private hands. 1. Mrs Elizabeth Montgomery, who lived at Snake Ridge between 1872 and 1878. 2. A. W. Howitt, letter to his mother, Mary Howitt, November 1860. Howitt Papers, State Library of Victoria, Ms 9356, Box 1045/39. Thank you to Tom Darragh for his assistance with the transcription of von Guérard’s Old German notes.